Archaeologists in Poland say they have discovered a skeleton with a brick stuck into the mouth — evidence that the subject was believed to be a vampire. Dated to the 16th-17th century, the grave was unearthed during excavations in the town of Kamien Pomorski, in northwestern Poland, the Kamienskie.info website reported. In addition to the brick, which was wedged so violently into the mouth to knock out the upper teeth, the skeleton featured a leg with a hole likely made from a puncture. This would suggest the leg had been staked to the ground to prevent the individual from rising from its grave. “A piece of debris brick in the mouth and a pierced thigh indicate this is a vampiric burial,” Slawomir Gorka, the archaeologist who led the dig, said. People feared that those accused to be vampires would rise from their graves like zombies. In some cases, to kill the undead creatures, they placed a stone or brick into the mouth so that the vampire would starve to death. According to Gorka, such vampire-slaying rituals were common in local graves between the 13th and 17th centuries. Indeed, it’s not the first time that “deviant burials” have been unearthed in Poland and across eastern Europe. Last year, Polish archaeologists found a grave near the town of Gliwice filled with skeletons whose severed heads were placed atop their legs. 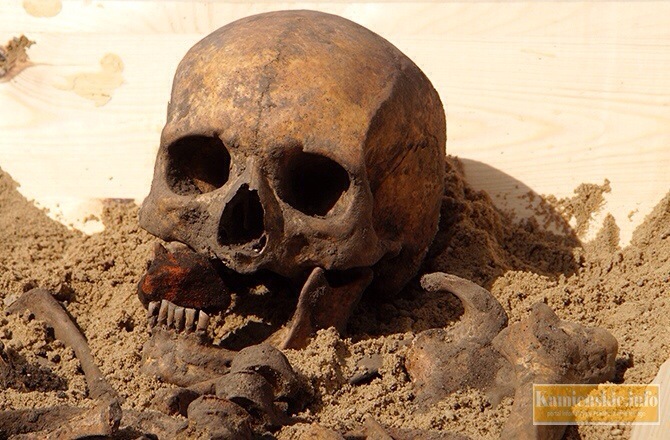 Such burials appear to be common in Slavic regions for people accused of vampirism, although alternative hypothesis suggested the skeletons were simply victims of an execution. Deviant burials are often linked to Black Death-related cemeteries and to medieval ignorance of how diseases spread. Mass graves were often reopened to bury corpses during epidemics, exposing bloated bodies with blood seeping out of the mouth and with a hole in the shroud used to cover their face.